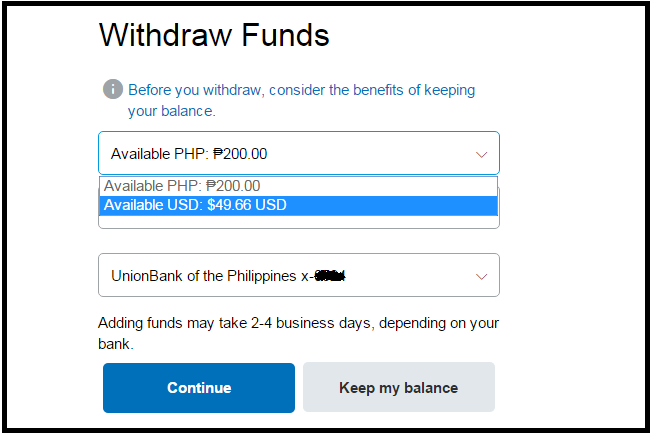 One of the most efficient and fastest ways to encash your PayPal funds in the Philippines is by getting a Visa EON debit card from UnionBank. With the card, you can easily transfer your PayPal funds to an ATM card with just a few clicks of the mouse button. The money will register in your card between two to seven days after the transfer. Getting an EON card is very easy. Just visit a UnionBank branch near you and inquire about the requirements. After getting your card, you will have to connect it to your PayPal account before you can start withdrawing your funds. A guide on how to do this can be found here. Anyway, below are the steps on how to withdraw your money from PayPal to your EON card. Step One: Log into your PayPal account. At the My Account page on the far left corner, you can see your PayPal balance. Under this is a text tab that says "Withdraw funds". Click on this tab. Step Two: In the next window, you are going to choose which of the available balances you would want to withdraw from. Just hover the mouse button on the balances and click the one you are going to withdraw from. After that, you will have to enter the amount that you want to transfer to your UnionBank EON Visa debit card. After entering the amount, find and choose Visa on the dropdown menu. Everything's a breeze after this step. Keep in mind that in transferring your PayPal funds to your EON debit card, you will be charged $5 with each transaction. Form example, if you withdraw $50, you are going to receive $45. Furthermore, the processing of your withdrawal may take between 5 to 7 days.